UNITED NATIONS, Jun 30 2016 (IPS) - Saudi Arabia’s membership in the Human Rights Council (HRC) should be suspended by members of the UN General Assembly, Human Rights Watch (HRW) and Amnesty International (AI) said on Wednesday. The two human rights groups have joined forces to make the exceptional call for action, noting that it is based on Saudi Arabia’s “gross and systematic violations of human rights” in Yemen and domestically. “We believe that…Saudi Arabia does not deserve to sit anymore on the Human Rights Council,” HRW’s Deputy Director for Global Advocacy Philippe Bolopion said to press here Wednesday. HRW and AI allege that they have documented 69 unlawful airstrikes by the Saudi-led coalition in Yemen, which have killed at least 913 civilians including 200 children. In total, the UN Human Rights Office estimates that there are more than 9,000 causalities since military operations began in Yemen in March 2015. UN High Commissioner for Human Rights Zeid Ra’ad Al Hussein said that the Saudi-led coalition is responsible for twice as many civilian causalities as all other forces put together. In a recent report, Secretary-General Ban Ki-moon found that the coalition was responsible for 60 percent of recorded child deaths and injuries, and nearly half of the 101 attacks on schools and hospitals. “I had to make a decision just to have all UN operations, particularly humanitarian operations, continue,” the Secretary-General said upon receiving criticism of the move. “I also had to consider the very real prospect that millions of other children would suffer grievously if, as was suggested to me, countries would defund many UN programs,” he continued. In response, the Saudi ambassador to the UN Abdallah Al-Mouallimi denied the use of threats and intimidation to remove the country from the list. “It’s important to defend this very important mandate to protect children affected by armed conflict. Member states of the General Assembly ought to stand up and defend this mandate,” Bennett told the press. In addition to the UN’s reporting, HRW and AI have also documented 19 attacks by the Saudi-led coalition in Yemen involving internationally banned cluster munitions, many of which were in civilian areas such as Sana’a University. Alongside the nine nation-strong coalition led by Saudi Arabia, Executive Director of HRW’s Middle East and North Africa Division Sarah Leah Whitson also noted that the United States and the United Kingdom have “crossed the threshold to become a part of this war” by being principle suppliers of weapons including cluster munitions. In 2015, Saudi Arabia purchased $20 billion of weapons from the U.S. and $4 billion from the UK. The two Western nations have also provided intelligence support and targeting assistance during the conflict. This makes them legally responsible for crimes being committed on the ground, Whitson stated. Meanwhile, the coalition’s naval blockade of Yemen’s ports have drastically limited the supply of food and medicine, leaving over 80 percent of the population in need of some form of humanitarian assistance. This barrier and starvation of civilians is “a method of warfare and a war crime,” Whitson said. Saudi and U.S. officials could not immediately be reached for comment, but members of the coalition have repeatedly denied any violations of human rights. Domestically, Saudi Arabia’s country’s crackdown on dissent has also persisted. In 2015, at least six people, including prominent writers and activists, were punished for the expression of their opinions. One was sentenced to death. Even speaking to human rights groups such as HRW and AI is an offense, said Director of AI’s Asia-Pacific Program Richard Bennett. Executions have also surged, Bennett noted. Just in 2016, at least 95 people have been executed, higher than at the same point last year. Approximately 47 of them were killed in a mass execution in January. Many of these executions are for offenses which, under international law, must not be punishable by death. Despite the well-documented violations in international humanitarian and human rights law, Saudi Arabia has used its membership in the HRC to shield itself from scrutiny and accountability, the two groups said. In 2015, Saudi Arabia thwarted a resolution in the HRC that requested an investigation on alleged war crimes and other violations by all sides to the Yemeni conflict. Instead, the country drafted its own resolution that did not include a reference to an independent UN inquiry. HRW and AI have also called on member states of the General Assembly (UNGA) to act in accordance to Resolution 60/251. The resolution states that the UNGA, with two-thirds of the vote, can suspend the rights of membership in the Council if a member commits human rights violations. The rule has previously been invoked in 2011 when Libya’s membership was suspended due to human rights violations. “We realize that the odds are against us,” Bolopion stated when asked about the likelihood of Saudi Arabia being suspended. But Bolopion hopes the campaign will be a “wake-up call” for other countries to see that they cannot get away with conducting human rights abuses and to clean up their act. 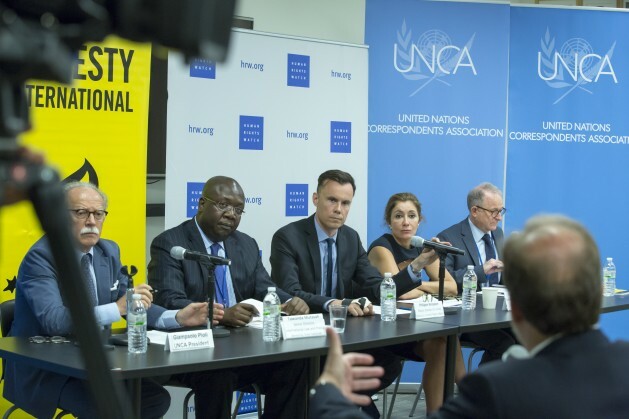 HRW and AI also stressed that action is essential in order to maintain the UN’s integrity. “Failure to act on Saudi Arabia’s gross and systematic human rights violations committed in Yemen and its use of its membership to obstruct independent scrutiny and accountability threatens the credibility of both the Human Rights Council and the General Assembly,” Bennett concluded. In March 2015, Saudi Arabia, along with nine Arab states including Egypt and Kuwait, intervened in the Yemeni conflict and has since clashed with Houthi forces. Despite UN-mediated peace talks which produced a ceasefire, there have been “serious violations” by both parties, the Secretary General said to Yemeni negotiators. The negotiations are set to resume in mid-July following the Muslim Eid holiday.